A site at Sha Ling, North District has been identified for the development of the facility with a daily treatment capacity of 300 tonnes for treatment and recycling of food waste into renewable energy. Phase 1: The Combined Heat and Power (CHP) generating systems utilise biogas (a form of renewable energy produced in the course of sludge treatment) to generate electricity and heat for use by the treatment works. Phase 2: Thermal hydrolysis pre-treatment of sewage sludge increases production of biogas. Landfill gas is put into beneficial use for electricity and heat generation to support the daily operation of landfill. Surplus landfill gas is treated for use as an alternative energy source for a town gas production plant in Tai Po. We aim to increase water sources including reclaimed water to combat climate change. The current target is to supply reclaimed water to the North East New Territories in phases for non-potable uses starting with Sheung Shui and Fanling from 2022 onwards. Phase 2: An additional CHP generating system will be installed to enhance biogas utilisation. Photovoltaic panels are used to convert solar power into electricity. It is estimated that 0.12M kWh of electricity could be produced annually. Being the first landfill gas utilisation project in Hong Kong, it has been in operation since September 1999. Landfill gas is piped to the nearby plant in Tai Po as an alternative fuel in town gas production. Phase 1: The Combined Heat and Power (CHP) / micro-turbine generating systems utilise biogas (a form of renewable energy produced in the course of sludge treatment) to generate electricity and heat for use by the treatment works. The Inter-reservoirs Transfer Scheme will strengthen the resilience and preparedness in flood mitigation and water conservation against uncertainties and challenges to be brought by climate change. By converting water power from High Island Reservoir into electricity, 0.5M kWh of electricity is expected to be generated by the hydropower plant annually. Energising Kowloon East provides effective use of resources and creates a high quality urban environment in Kowloon East. Relevant measures include (1) blue-green infrastructure, (2) resource-efficient infrastructure and (3) environmentally-friendly design, thereby promoting a sustainable neighbourhood. A centralised grey water reuse system to reuse grey water for toilet flushing purpose. A rainwater harvesting system to collect rainwater for irrigation and recreational functions for an artificial stormwater attenuation lake after proper treatment. First stage of the desalination plant will have an output capacity of 135 000 cubic metre per day, expandable to 270 000 cubic metre per day (about 5-10% of overall fresh water demand). It will provide a strategic alternative water source as a climate change adaptation measure to safeguard water security in Hong Kong. Landfill gas is put into beneficial use for electricity and heat generation supporting the daily operation of the landfill. The surplus landfill gas will be treated and exported to the off-take station at Tseng Lan Shue for injection into the supply grid of town gas. The Government has commissioned studies to review the effect and implication of climate change on the design of coastal infrastructures based on an assessment report prepared by the Intergovernmental Panel on Climate Change. Formulation and implementation of comprehensive pedestrian improvement schemes to enhance connectivity and walkability to promote walking. Phases 1 & 2: completed: provision of district cooling services commenced in 2013. Phase 3: being constructed for completion in 2023. District Cooling System at Kai Tak Development is a large scale centralised air-conditioning system. It consumes 35 percent less electricity compared with individual air-cooled air-conditioning systems. It will achieve an estimated annual saving of 85 million kWh in electricity consumption. This stormwater storage tank underneath Happy Valley recreation ground harvests groundwater and rainwater for irrigation and toilet flushing, thus relieving the pressure on water resources. Central Mid-Levels Escalator Link provides a vertical pedestrian link between Central and Mid-Levels to promote walking. The grid-connected wind turbine is designed for automatic operation and will generate electricity when wind speed is in the range of 3 to 25m/s. It has been producing about one million units of green electricity. The solar power system comprising 5 500 amorphous silicon and 3 162 amorphous/microcrystalline silicon tandem junction Thin Film Photovoltaic (TFPV) modules has a power generation capacity of 1 MW. The system generates 1 100 000 units of electricity annually. Currently, about 70% of Hong Kong's carbon emissions come from electricity generation. Using natural gas for electricity generation helps reduce the use of coal, which is the most carbon-intensive fuel in our fuel mix. Lamma Power Station has two gas-fired combined-cycle generating units which came into operation in 2006 and 2008 respectively. The new drainage tunnel intercepts stormwater from Mid-levels. It relieves the discharge load of the existing downstream drainage systems, and therefore improves the flood resilience of the Hong Kong Island. Tamar Park and its adjacent Central and Western District Promenade (Central Section) provide spacious green lawns for visitors to stroll or sit. The park also provides visitors with barrier-free access from Admiralty to the Central Piers and Star Ferry Pier. Other facilities include a landscaped garden, water features, viewing platforms, Tamar Café, and toilets. Art Park and Harbourfront Promenade will be easily accessible by walking. They will be the green heart of the cultural district and feature a rich variety of trees and green planting as well as open lawn spaces for leisure, relaxation and outdoor performances. The footbridge connecting Tsuen Wan Plaza, Skyline Plaza and the adjacent landscaping area is a direct and elevated passage. The footbridge connects the existing pedestrian walkway system in the area, enhances the existing local footbridge network and strengthens the connection between the northern and southern parts of the area. It encourages walking instead of taking transportation. A site at Shek Kong of the Yuen Long District has been identified for the development of the facility with a daily treatment capacity of 300 tonnes for treatment and recycling of food waste into renewable energy. To adapt to climate change, we have to further strengthen our slope safety. In anticipation of the likelihood of more frequent extreme rainfall events that could cause serious landslide disasters with multiple fatalities and economic losses in our city, the Civil Engineering and Development Department (CEDD) launched the LPMit Programme in 2010 to deal with vulnerable natural hillsides and man-made slopes. Yuen Long Bypass Floodway is located near the middle reach of the Yuen Long catchment and intercepts a significant portion of discharge from the upper portion of the catchment. Thus, it minimises massive drainage improvement works in Yuen Long Town and provides a cost-effective solution to increase flood resilience in the Yuen Long Town. Phase 1: A micro-turbine system to utilise biogas (produced in the course of sludge treatment) to generate electricity for use by the treatment works. Phase 2: An additional micro-turbine system will be installed to enhance biogas utilisation. A waste-to-energy facility which generates electricity through sludge incineration. Currently, about 70% of Hong Kong's carbon emissions come from electricity generation. Using natural gas for electricity generation helps reduce the use of coal, which is the most carbon-intensive fuel. Black Point Power Station has eight gas-fired combined-cycle generating units which came into operation in phases from 1996 to 2006. By converting water power from Tai Lam Chung Reservoir into electricity, 3M kWh of electricity is expected to be generated by the hydropower plant annually. It is a facility at Siu Ho Wan, North Lantau with a daily treatment capacity of 200 tonnes for treatment and recycling of food waste into renewable energy. Comprising over 4 200 photovoltaic panels, this solar farm could generate 1.1M kWh of electricity annually, which can meet approximately 25% of the energy need of the treatment works. The debris-resisting barrier constructed under the Landslip Prevention and Mitigation Programme offers a creative solution to protect the North Lantau Expressway and helps deal with debris flows from natural terrain triggered by extreme rainfall events. The landscaped barrier also blends into the surrounding natural environment and could be a suitable habitat for wildlife. Upon full operation, IWMF Phase 1 could treat about 3 000 tonnes of municipal solid waste per day and about 480 million kWh of surplus electricity generated would be exported to the power grid, equivalent to the power consumption by some 100 000 households. In addition, through the significant reduction of the volume of waste for landfill disposal and replacement of fossil fuel use for electricity generation, the IWMF Phase 1 could reduce carbon dioxide emission. Our railway network serves as the backbone of Hong Kong's low-carbon public transport network. The railway network is extensive and covers major areas in Hong Kong. By 2021, our railway network will be expanded to over 270 km in length and cover areas inhabited by over 70% of the population in Hong Kong. The Government's policy is to foster a bicycle friendly environment in new towns and new development areas, so as to promote cycling as a zero-carbon mode for short-distance commuting or leisure, and to reduce the use of mechanised means of transport. Green buildings are designed, built, operated, and renovated in a sustainable, environmental-friendly and resource-efficient manner to meet objectives such as using energy, water, and other resources more efficiently and reducing the overall impact to the environment, etc. We can save energy through incorporating green building features and the use of energy efficiency technologies and products. 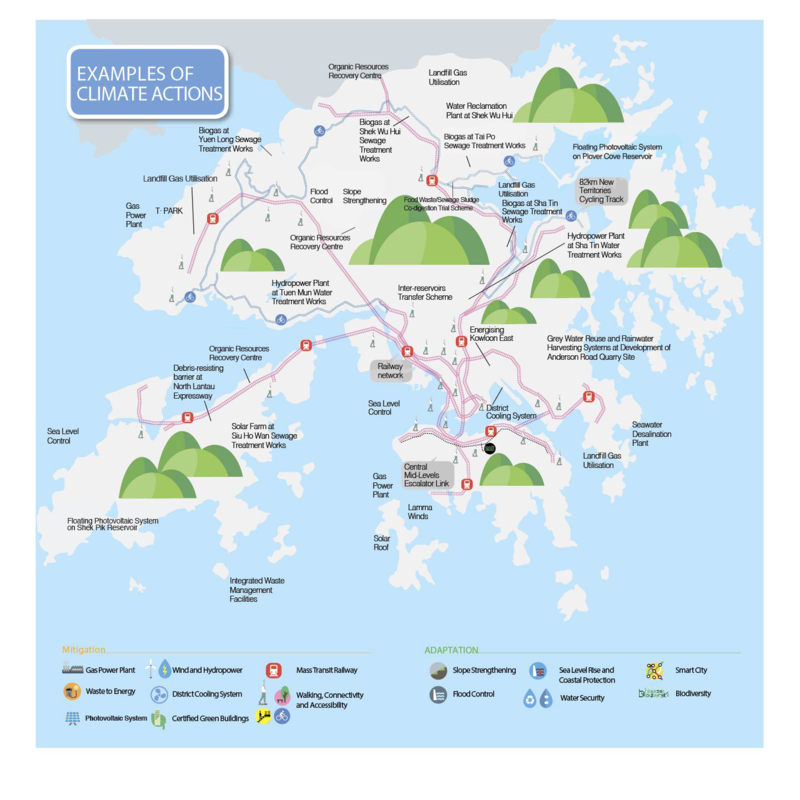 24 Country Parks, 22 Special Areas, and 5 Marine Parks and 1 Marine Reserve are established in Hong Kong. The Government will enhance existing measures and undertake new measures, including the enhancement of management of protected areas such as country parks and marine parks as well as the designation of new parks, to conserve biodiversity. Landfill gas is put into beneficial use for electricity and heat generation to support the daily operation of landfill. A pilot plant for co-digestion of food waste and sewage sludge, with a maximum daily handling capacity of 50 tonnes of food waste, will be constructed at the Tai Po Sewage Treatment Works. The co-digestion pilot trial is collaboratively administered and run by the Drainage Services Department (DSD) and Environmental Protection Department (EPD). EPD is responsible for reception and pre-treatment of food waste while DSD is responsible for anaerobic co-digestion of food waste and sewage sludge, collection and storage of biogas (a form of renewable energy) produced, and heat and power generation from biogas for use at the treatment works. While co-digestion aims to increase production of biogas and raising food waste treatment capability at the same time, the pilot trial is to ascertain the technical feasibility, installation requirements and benefits of co-digestion.